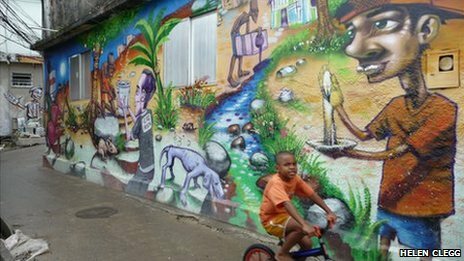 In the previous post, Hello Brazil, I wrote about the rise of 'favela tourism' as we approach the 2016 Olympics in Brazil. 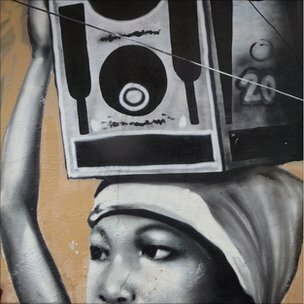 Here is an article highlighting the visually stunning street-art scene of Rio's shantytowns. With not only the 2016 Olympics but the 2014 FIFA World Cup coming, things are changing in Brazil's slums, or favelas. With local and federal government assistance, people now have water and electricity. In addition, these once incredibly violent, gang-ruled, drug-infested urban communities are finding a voice and taking ownership of their past, now brilliantly illuminated on the homes of its residents. Wealthy neighbors are curious to learn about these communities, segregated by culture and class from themselves. I've screened this film for students at the University of Connecticut. One can read about the violence of the slum or even see fictional cinematic depictions, as in the film, 'City of God', but raw footage, the spontaneity of an unscripted life as presented here, is stunning and shocking, providing an unparalleled perspective on the challenges and dangers of urban poverty. Nancy Scheper-Hughes ethnography, Death Without Weeping: The Violence of Everyday Life in Brazil, provides an extraordinary historical, political and economic examination of survival in a Brazilian slum. This is a detailed, personal look at how powerless, impoverished mothers contribute to, through benign neglect, and cope with the horrors of child death. The story is extraordinary, written with page-turning, gut wrenching clarity. When one mother was admonished by Scheper-Hughes for saying in front of her emaciated seven-year old, "He's not going to live long. Soon he will join the others (i.e., his dead siblings)," the child responded, "Hush, Mae, hush. I'm not afraid; I'm ready to go there" (pg. 142). It you have ever wondered how people manage to survive in a world of racism, poverty and disease; how the disenfranchised socially construct an oppositional approach to sickness and health, one where infants must show their mothers they want to live, this is your entree. But, as Scheper-Hughes has noted, things are not now as bleak as when she conducted this research. 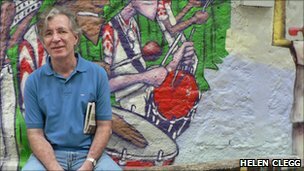 Nevertheless, as Brazil readies itself for the world stage, I urge you through film, books or the following article to learn more about the art, music and people of this beautiful and unique nation. 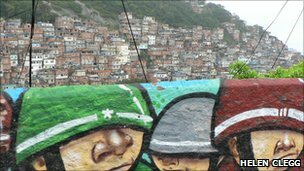 For the BBC World article, Rio de Janeiro's favelas reflected through art, click here or continue to read below. High above Rio de Janeiro's beachside neighbourhoods is Cantagalo, one of the many favelas clinging to the city's hillsides. Cantagalo, along with the communities of Pavao and Pavaozinho, is a winding mass of concrete alleyways and stairwells that snake up the hill overlooking the famous Ipanema and Copacabana beaches. Every day thousands of the favela's residents travel down the hill to work in the homes, shops, hotels and bars of their richer neighbours but the daily migration is one-sided. Many wealthier Rio residents have never set foot in Cantagalo but an ambitious new project in the hillside community is working to change that. Museu de Favela is trying to turn the shantytown, which is home to more than 20,000 people, into a popular destination. Like an art gallery that has exploded on to the streets, the Museu is made up of a series of huge murals covering 20 buildings, all commissioned by local artists. "Samba, capoiera, funk, everything that the elite of Rio de Janeiro enjoy comes from the favela," says Sidney "Tartaruga" Silva, vice-president of the Museu, as he guides visitors up the hill. The project's aim is to reflect the history of this urban community and give a voice to the people who live there. "At the same time as the residents go down the hill to work," says Mr Silva, "these districts should start to get to know this community and stop this segregation." It is estimated that some 20% of Rio de Janeiro's eight million-strong population live in favelas. Many of Rio's favelas are perched on the hilltops surrounding the city. Like many urban slums, it has been a hotbed of poverty and crime; run by druglords it was a place where only the poorest lived. Recently things have changed. In 2009, the Brazilian government set about transforming the favelas and sent Police Pacification Units, known as UPPs, into some of the slums. And, because many of the favelas in Rio are built on a hill, with staggering views across the city, local authorities have been on a drive to make them a popular destination for tourists. But Sidney Silva's project is one step ahead of them. Run by the local community itself, Museu de Favela is a project that draws on the deep cultural traditions of the shantytown to tell its story, not just to tourists but to Brazilians too. It recognizes favela culture as something residents can be proud of, a story they can tell to those who would never set foot here before. Max Andrade is a doctor from Rio de Janeiro, but admits that he has avoided the area until now. "Normally we don't go into the favela," he says. "Until the police were posted here there was a lot of crime, it was very dangerous." Today he wanders around the neighbourhood with Carlos Ezquival, president of the museum. A street artist himself, he goes by the name of Acme. Mr Esquival proudly explains the simple stories of everyday life behind each mural they pass. "This painting on the side of this house is portraying difficulties in the community," he says, "like the difficulty of walking up the hill with a huge can of water on your head." The theme of each one is suggested by a local resident and this one resonates with 46-year-old Diva. She has lived in Cantagalo all her life and remembers the battles that used to rage over access to water. "It was always a huge fight because you would queue with a little tin and someone would come along with 50 tins and then there was a fight. "There were women pulling each other's hair, even the police had to come up sometimes," she remembers. "Today I see a different community." Most of the houses in the favela now have access to water and electricity and Diva is happy to have these memories consigned to history, though not forgotten. Despite these improvements, life in the favela is still fraught with insecurity. Carlos Esquival saw this when he approached residents asking to use their homes as canvasses. "When I arrived with something to sign they were very suspicious," he explains. "They thought I was from the government and wanted to take their homes off them because at the moment there are a lot of works going on. Houses are being demolished to create new roads." The difference between the favelas and the rest of Rio is still stark. Dr Andrade acknowledges this. "This is a different world, a world where relationships are different, a world I don't know," he says. "I want to bring my daughters and my friends because no one that I know has come here. I think people can't imagine what it is like."